You are here: Home / Business & Trades / Mr Carricks shop, High Street, Hemyock. 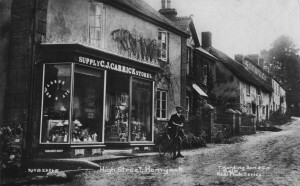 Mr Carricks shop, High Street, Hemyock. Looking up the High St. to Mr. Carricks shop, the windows are elaborately dressed with oil-lamps on the left and a tiered display on the right. Inside the shop, boots, buckets and jugs etc. were hung from many hooks on the ceiling.